Thank you Brian Falkner. Thank you for writing the kind of book that I was craving! Northwood is the reminiscent of the stories I adored as a child. Fairy tales, filled with dark forests, brave heroes, and hidden castles. It's the type of story that is unpredictable, and filled with adventure. The type of story that doesn't talk down to its young readers, but instead embraces them within its pages. This is the stuff that bedtime stories are made of. Cecelia stole my heart. Our heroine in this book, she isn't just brave but smart and honest as well. I think the perfect word for Cecelia is tenacious. She just doesn't give up! Whenever things weren't going her way, she worked around it. Sure, she was afraid at times. What ten year old wouldn't be? She just never let it get in her way. Cecelia's character is the perfect role model for the young readers who will fall in love with this book. 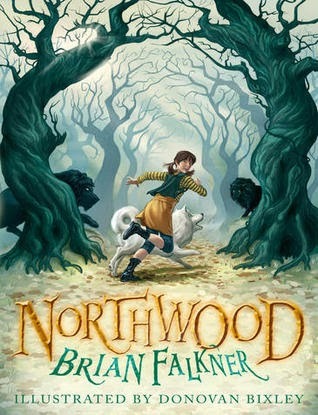 Northwood blends Cecelia's adventures with a fair bit of humor as well. Avery and Evan, our supporting characters on this adventure, were tons of fun! Bickering twins, these two were like night and day. Headstrong Avery, who was always willing to jump into danger when necessary. Sweet, silly Evan who tried so hard to seem smart that he was constantly misusing big words. These two bring a lightness to the story. Trials and tribulations come their way, but these three always keep their heads up. In fact, this whole story is just filled with the perfect kind of whimsy that will make young readers, and readers who are young at heart, smile and laugh. Houses made of balloons, hairy and evil Kings, and so much more. I can't deny that I fell in love with Miss Cecelia Undergarment. I'd happily follow her into any adventure she happens upon. Once again, thank you to Brian Falkner. Northwood spoke straight to my inner child, and delighted her to no end.